One of the more vivid stories from Black Saturday that sticks clearly in my memory is hearing of a lady who, about to be airlifted away from the approaching fire, let herself out of the harness to chase after her dog who had wriggled free. People criticised her for endangering the policeman rescuing her. I thought I would do the same in her case. This is the real story, from a radio interview I heard today. Rescue policeman David Key came on duty at 4pm, Saturday February 7th 2009. The police radio channels were inundated with chaotic calls. He thought it unlikely they would get a chance at performing many rescues due to the sheer speed of the wind and fires, but soon enough there came a call from the Channel 9 news helicopter: there were people trapped at a property on Coombs Road, Kinglake. David joined his crew in their helicopter and they were soon over the fires. Directed to the right spot by the news helicopter they performed all the requisite safety checks. Satisfied they were in a good position to go, David was winched down to the waiting people. Just to set the scene, the temperature hit 46C (unofficially it went over 50C), the wind strength was likened to hurricane force, well over 100km per hour, fire-generated weather phenomena included tornadoes of fire. The fires, driven by the southerly change, were roaring up the side of the Kinglake mountain toward the town, and had already wiped out several towns including Strathewen. The house over which the helicopter was hovering was almost completely surrounded by fire. The house belonged to a lady called Juliet. When David reached the ground she told him she had to take her dog with her. David (so calm in his telling) said that was no problem. He put Juliet in the rescue harness and they sandwiched the dog between them. On the verge of giving the go ahead to be winched up, a wind gust hit the line, knocking them off balance. The dog was spooked and managed to wriggle free. Now, this is where the real story departs from the reported one. David looked up and found the winch cable behaving in an alarming manner, tightening and going slack. Above, the helicopter was struggling, and even more alarming, beginning to drop. What was happening was the fires all around them were so hot, so high, that they were sucking all the oxygen out of the atmosphere. The air became so thin that it could not support the helicopter’s weight. The crew made a snap decision and cut the winch cable. So, Policeman David was on the ground with Juliet, her dog, several neighbours and three horses. And fire all around them. They got into their cars, two horses in a float and the third with a coat on who was led by a rein held by one of the people in the cars. The driveway to the house was on fire. The length of the road was on fire. The helicopter directed them to the only way out – through the flaming driveway, down the road to a fire track. They went in convoy, at the speed of the trotting horse – who was remarkably calm despite cinders falling on his head, mane and tail. Out on to Coombs Road, David directed everyone with professional calm. And here is the nugget of wonder in this story. As they made their way down the road, which was burning madly on both sides, they were joined by other refugees. Out of the trees came deer – feral animals to this country – and echidnas and wombats, just as desperate to survive. Perhaps they were drawn by the horse, whatever it was, they knew by instinct that to follow that movement was perhaps their only chance to live. And this little convoy / Noah’s ark on hoof and paw made it to the fire track and then out into a paddock that the fires had avoided. Juliet looked back to her house but could only see flame. She was convinced it was gone. But. Her house survived – the only one on Coombs Road not destroyed. Everyone in David’s group, human and animal, survived. David rejoined his helicopter and went on to rescue others. This is one of those little stories that happen within a major horrific event and they often don’t get told. They should though, particularly in light of the 13 poor people who lost their lives on Coombs Road that day, including Brian Naylor and his wife – Brian was the retired long term news reader on Melbourne’s Channel 9 news, coincidentally or not, the channel whose news helicopter directed the police rescue crew to Juliet’s house. So, contrary to the little snippet of this story that was reported after the fires, where people tut-tutted about a silly woman putting her dog before her own safety, had that dog not wriggled free at just that moment, David and Juliet and her doggie might have been dangling halfway up the winch wire when the helicopter lost height. That might have delayed the wire being cut, and could conceivably have caused the helicopter to crash, right on top of the people and horses, in the path of the fire, almost certainly resulting in more deaths. Moral of the story: pay attention to the instincts of animals, particularly in a crisis. And hug a policeman today. Do a search on Google maps for Coombs Road, Kinglake. A quarter of a million knitted and crocheted poppies - and somewhere in there are the ones my mum made. They are spread across the forecourt of Federation Square in Melbourne today, and tomorrow will line the route of the ANZAC Day march down St Kilda Road for the 100th anniversary of the landings at Gallipoli. 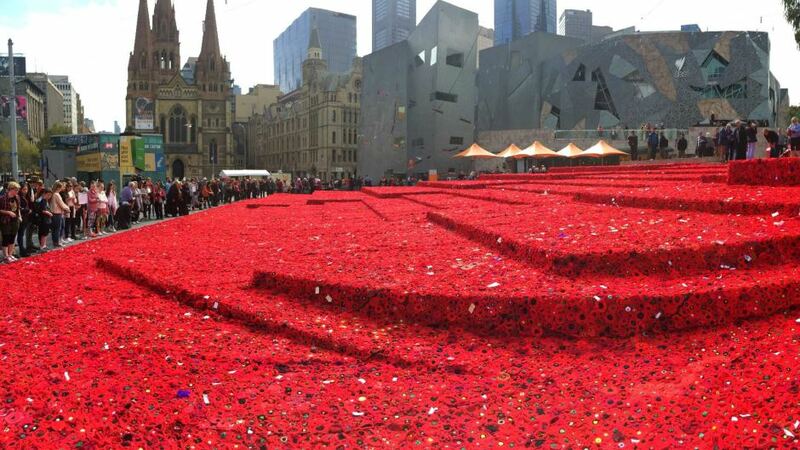 This came from one lady's idea to make a few poppies that quickly spread all around the state, country and even to people overseas. I really like them - in the deluge of documentaries, music, books, ceremonies etc that are going on these last few weeks, it's a simple, quiet way of honouring those cheery chaps who went off on a grand adventure 100 years ago and ended up in a living hell. Bless. Leonard Nimoy has moved on, gone to join De and Jimmy. I had just got in the car and was driving up the street. The radio people were talking about 'his' last tweet, signed off with LL&P. I pulled over, disbelieving, knowing who they were talking about. 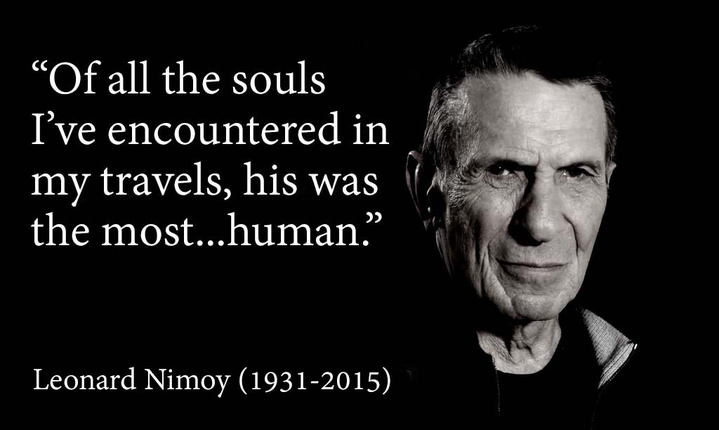 By playing an alien on a tv show, Leonard Nimoy brought the best of humanity to us. He showed us a future filled with not just exploration, new worlds and new adventures, but an evolution of intelligent life to a place where peace and cooperation are foremost. Leonard took a divided alien character and made him into an icon that many have looked up to and been inspired by, and will continue to do so for a very long time to come. I loved his little quirks of humour, the way he could niggle at Bill and De to bring out a laugh, particularly in the middle of a serious scene. 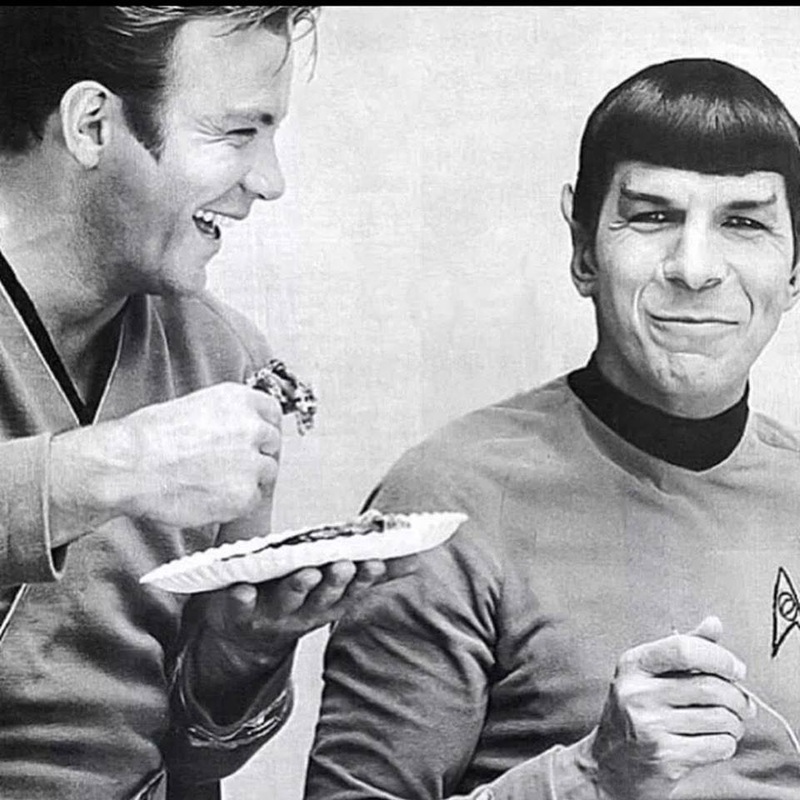 Star Trek was the first science fiction I came across, and decades later the wonder of the original show and the books inspired by it still has not faded. I'm sitting here watching City on the Edge of Forever and again am choked up with emotion in the final scenes - 'He knows, Doctor, he knows...' These people, these actors who brought the characters to life, they are why Star Trek has been so consistently popular, so loved for such a long time. Not the wobbly sets, not the plastic props - the characters given life by the actors. So, thanks for sharing yourself with us, Leonard. Fair journey to you. 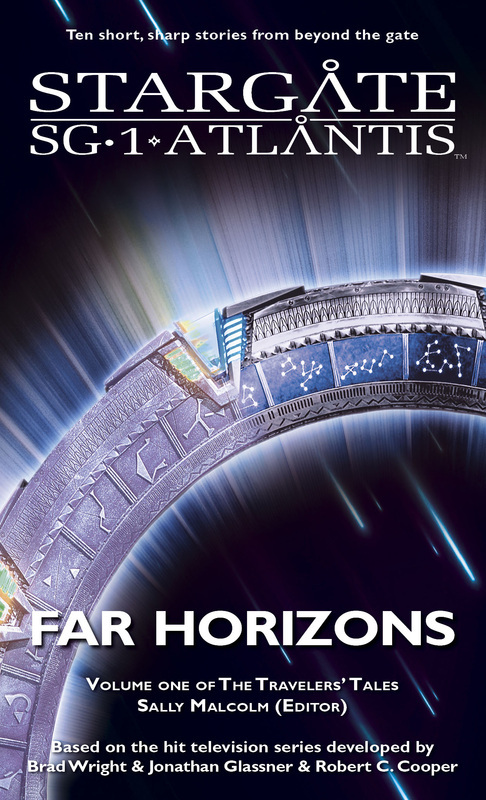 Stargate Far Horizons is published today! This is a first-off anthology of short stories featuring Stargate SG-1 and Stargate Atlantis, celebrating the ten years of Stargate adventures published by Fandemonium. There's a wonderful collection of authors in the anthology, promising a nice variety of tales. Step up and buy a copy, and show the world that the popularity of both Stargates is as strong as it has ever been. Links are on my website. Just received the cover art for the upcoming Stargate SG-1 & Atlantis Far Horizons. Very pretty melding of the SG-1 and Atlantis Gates. Far Horizons is published in ebook on October 23rd, and the paperback edition follows along a couple of weeks later. Anyway, on one wall I caught a glimpse of “Aust Force” and had to laugh at our boys from the First AIF who were stationed at Mena Camp in 1914-15. Then they showed another name, Sister MT Martin 6.2.15. She had to be an Aussie. Quick search and sure enough Mary Therese Martin from Newcastle was a member of the AANS. She looks like a spirited woman, one who obviously had no trouble climbing up the Grand Gallery and most likely up rickety wooden ladders to get into the small space of the top chambers – in a long skirt! Bet she never thought that a hundred years later her handwriting would be seen by the whole of her country. Thinking of all the people who died or suffered in the attacks in America. I'm watching a doco made from footage people around New York took during the attacks. Still horrendous. It's almost the exact time 13 years ago I was watching this unfold. Listening to the firemen actually up in the buildings - heavens bless them all. Last Saturday I went with a friend to a writing workshop with Aussie romance writer Anne Gracie in the grounds of the gorgeous Ripponlea homestead. She had some wonderful tips and techniques to help in the writing process, some of which were: characters must develop, don't make them TSTL (too stoopid to live! ); dialogue brings empathy to the reader and banter brings them to life (immediate thought - Jack and Daniel!! ); and Storytelling trumps craft - you can have all the technique in the world but the story is what will carry the reader to the end of the page. It was a really enjoyable couple of hours. Anne was very generous with sharing her experience and insight. I bought a couple of her books and have already finished The Autumn Bride. I've never read Regency romance before but I found it very compelling. The characters were wonderful and it was a fun read. Announcing our very first anthology of STARGATE SG-1 and STARGATE ATLANTIS short stories – Far Horizons. Available this fall, and with contributions from Stargate novelists old and new, Far Horizons will take you through the Stargate to the furthest reaches of both the Pegasus and Milky Way galaxies. Far Horizons will be available this fall in eBook and print formats. Satellite images of our changing world. This site has fantastic satellite images taken over years of our changing landscapes. The hole in the ozone layer is boggling. I remember the first time I read about it in a magazine at work. I still remember thinking 'Crikey, shouldn't people be paying more attention to this?' The pictures of the drought in Australia bring our own reality home. The devastation of the Amazon is just sickening. Photo: Little nibbler, Hall's Gap.